The Canadian state has enacted its National Anti-Terrorism Plan, which involves the coordinated mobilization of all sections of the national-security apparatus, including the military, in response to the shooting Wednesday morning of a soldier at the National War Memorial in downtown Ottawa and storming of the national parliament building by a gunman. The soldier, 24 year-old Canadian Armed Forces Reservist Nathan Cirillo, succumbed to his injuries. Soon after, security forces shot and killed a man armed with a rifle in what is being described as a wild shootout in the Hall of Honour. The hall, which is both a ceremonial hall and main corridor, accesses the rooms where the ruling Conservatives and Official Opposition New Democratic Party (NDP) were holding their weekly parliamentary caucus meetings. When the shooting erupted, both Conservative Prime Minister Stephen Harper and NDP leader Thomas Mulcair were at their respective party meetings. Police-intelligence sources have identified the dead gunman as Michael Zehaf-Bibeau. He was reportedly under surveillance by Canada’s national security agencies and had had his passport confiscated to prevent him from traveling to the Middle East to link up with Islamist militia groups. 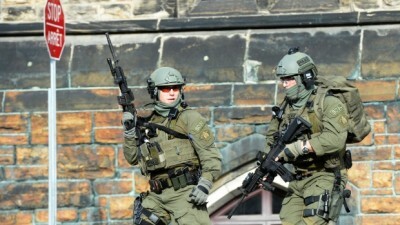 In the aftermath of the Parliament Hill attack, police mounted a massive security operation, saying they believed there had been multiple attackers. The media cited unconfirmed reports of multiple shooters and shots being fired at locations other than the War Memorial and Hall of Honour. From the parliament buildings, the police rapidly expanded a security perimeter, placing offices, shops and schools under lockdown, closing off streets to all vehicular and pedestrian traffic, and deploying heavily-armed SWAT teams. The locked-down area quickly came to encompass much of downtown Ottawa, confining thousands of government workers, shoppers, tourists and Ottawa University students. Schools throughout the city were either in lockdown or semi-lockdown. The latter was described as students being confined to their classrooms with no one allowed to enter or leave. The lockdown remained in effect throughout the afternoon and early evening, ending only at 8:30 PM. According to one news report, police were stopping vehicles leaving Ottawa in the direction of Montreal and questioning their occupants. The emergency measures extended well beyond Ottawa. In Toronto, additional police were deployed at the Ontario legislature, City Hall, government and military facilities and on the subway. In Montreal, City Hall was closed to visitors and at the Quebec National Assembly in Quebec City, security was doubled and a helicopter circled the building. All Canadian Armed Forces bases have been placed on high alert and NORAD, the joint US-Canadian North American Aerospace Defense Command, has increased its “alert posture,” placing an increased number of fighter jets on high alert. The US has also heightened security along the Canada-US border. White House spokesman Josh Earnest began his daily press briefing by condemning the attack. In doing so he emphasized Canada’s importance as a military-strategic partner of Washington, including in the new war in the Mideast. Yesterday, eight Canadian Armed Forces CF-18 fighters left for Kuwait, where they will join the US bombing campaign in Iraq and Syria. Canadian Special Forces are already in Iraq. Whatever the motive for yesterday’s shooting spree, the action was utterly reactionary. It can only assist Harper’s Conservative government and the Canadian ruling elite in implementing their agenda of imperialist war abroad and sweeping attacks on working people’s democratic and social rights at home. The Ottawa attack will no doubt be exploited by the Obama administration. When Earnest spoke, there was no evidence whatsoever that the perpetrator of the Ottawa shootings had any sympathy for Islamacism, let alone ties to ISIS. Yet the White House spokesman was quick to claim that unless the US campaign against ISIS was successful, the jihadist organization would have a safe haven in Iraq and Syria from which to strike the US homeland. Yesterday’s events have obvious similarities to those that unfolded in St. Jean-sur-Richelieu, Quebec earlier in the week. A Canadian soldier was killed and another injured Monday when they were deliberately run over by a car driven by another individual whose passport had been confiscated to prevent him going to the Mideast and who was under heavy state surveillance, Martin Couture-Rouleau. (See: Canada: Harper using “terror attack” to impose anti-democratic measures). Even the corporate media has noted that the government’s response to Monday’s events was extraordinary, with Prime Minster Harper and his top aides moving quickly to frame it as an Islamist-inspired “terror attack” and citing it as proof of the government’s claim that the draconian 2001 Anti-Terrorism Act needed to be strengthened. In a sharp break with Canadian norms, it was Harper and the Prime Minister’s Office, not the police and security agencies, who fed the press with information about Monday’s attack and Couture-Rouleau’s ties to “radical Islam.” This began with Harper, in response to a planted question from a Conservative backbencher, telling parliament early Monday afternoon that there had likely been a “terror attack.” This was long before the police, let alone the media, had suggested any motive for the hit-and-run in St. Jean-sur-Richelieu. Since September 2001, governments have repeatedly seized on terrorist attacks—many of them facilitated by gross and unexplained security lapses—to push through long-planned, sweeping and reactionary policy changes. In unguarded moments, the likes of former British Prime Minister Tony Blair and former US National Security Adviser and Secretary of State Condoleezza Rice spoke about the “opportunity” represented by the 9/11terrorist attacks: the opportunity to mount aggressive wars against Afghanistan and Iraq, aimed at shoring up US imperialism’s global strategic hegemony, and push through attacks on democratic rights at home. Harper’s response to Monday’s events in St. Jean-sur-Richelieu and the police-military mobilization in response to yesterday’s attack—one that increasingly appears to have been the work of a lone individual—demonstrate that a similar campaign to shift politics further to the right is now underway. Harper went on to insist that “all necessary steps” would be taken to keep Canada safe. This was a clear reference to legislation, due to have been presented to parliament yesterday, that would expand the powers of Canada’s intelligence services and prohibit defence lawyers and even judges from questioning Canadian Security Intelligence Service (CSIS) informants. Harper also vowed to work with Canada’s allies “against all terrorist groups,” so as to ensure “they will have no safe haven.” This was a clear statement of the government’s intent to expand Canada’s role in the US-led war in Iraq and Syria. Currently, the government has authorized a six-month combat mission, but last week the head of Canada’s military indicated a much longer Canadian intervention will be required. Pursuing an agenda that is inimical to the interests of the vast majority of the population, Canada’s ruling elite, like its counterparts in the US and the other imperialist democracies, is increasingly turning to authoritarian methods of rule, chauvinist and militarist appeals, and the politics of fear-mongering and provocation.